I will be the first to admit that there are few things in life I find as rewarding as settling down to a great meal after a day of exploring the backcountry. I will also admit that the first meals Krista and I prepared in the field were less than stellar. 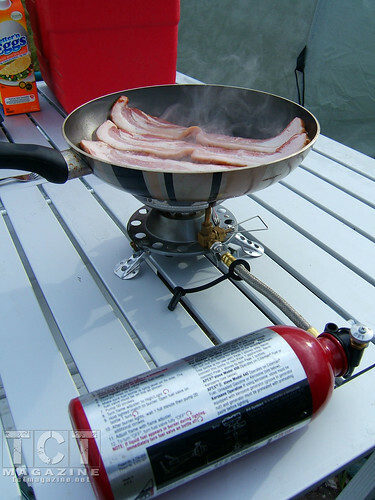 I was inexperienced cooking in the wilderness on a camp stove. I had grown up camping with Dutch ovens and had no idea what I was doing when I went to purchase our first stove. Over time I began to realize that not all camp stoves are created equal, and most have been purposefully designed for certain segments of the outdoor market. Over the next three issues, we will be examining the three factors you should address when choosing the stove that is right for you. My goal is not to tell you the stove you should buy but instead provide the right information for making your camping stove selection. In Part 1 we will see how knowing the types of meals you will be preparing during the trip factors into choosing a stove. Part 2 will cover the fuels used in camping stoves and we will end our series discussing the various stove designs and the features that make cooking in the field a little easier. The first thing to examine when deciding on a camp stove is the types of meals you want to prepare when out in the field as well as the number of people will you be cooking for. This falls back to what types of meals are you comfortable cooking at home. Not everybody cares to prepare an elaborate three-course meal at the end of a day’s travel. Conversely, some people want something more than a freeze-dried backpacking meal. So how do you strike a balance? The key is knowing one simple fact: it all boils down to the number of burners and how well those burners control the heat. 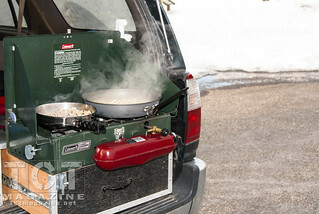 Someone interested in only boiling water for making coffee and rehydrating freeze-dried backpacking meals would be well served with a compact single-burner stove. The key for this type of cooking is finding a stove with a high BTU/hr rating and burner control is not critical because the stove will be turned all of the ways up to boil the water as quickly as possible. Someone interested in preparing a slightly more advanced meal will be more concerned with the burner’s temperature control than the amount of total heat the burner can generate. A 30,000 BTU/hr burner is of no use when sautéing garlic and ginger if the burner’s valve only provides an ‘all or nothing’ flame control. Unfortunately, this specification is not normally published in catalogs and online. It’s a feature you must test for yourself or scour through equipment reviews to find. We have found (as a rule of thumb) that a valve rotation greater than 180 degrees generally gives enough adjustment to adequately control the burner flame. There are exceptions to the rule as the type of valve used dictates the amount of flame control the stove has. We have cooked with stoves that provide more flame control in 180 degrees than others have in 360 degrees of rotation. Finally, the size of the burner plays a role in the type of cooking the stove is designed and used for. The burner on a micro backpacking stove is designed to provide a large amount of heat over a small surface area. These types of small burner stoves are designed for cooking meals in single serving cooksets and for rapidly boiling water. The burner’s small size does not provide even heat distribution over larger cook surfaces, causing hotspots on the cookware. These types of stoves generally limit the size of cookware used to relatively small in diameter. In contrast, the burners on large free-standing camping stoves are designed to provide heat over a large surface area. These stoves are designed for cooking large quantities of food in large pots and frying pans. All stoves are not created equal and are designed for specific styles of outdoor cooking. 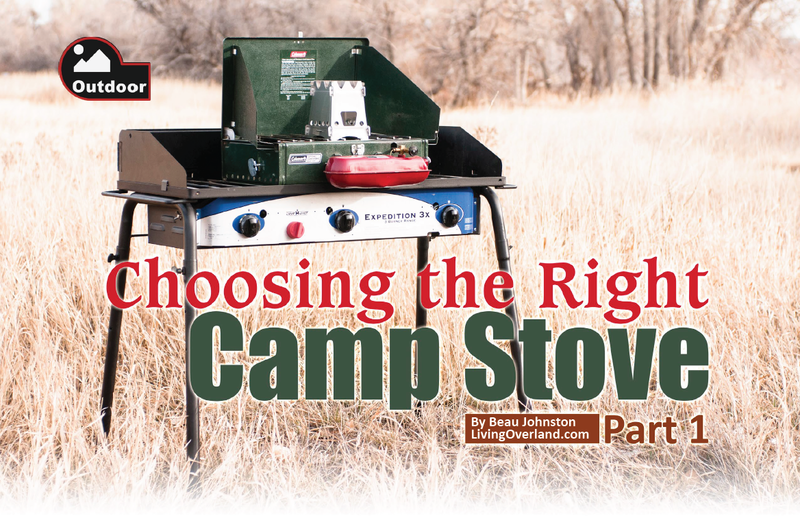 Knowing the types of meals you will be preparing in the field is crucial to finding a stove that is right for you. The burner on a given stove may provide ample heat for boiling water but may not have enough temperature control to prepare a roux without burning the flour. Next time we will discuss how the choice of fuel factors into choosing the stove that is right for your outdoor adventures and we will wrap up the discussion by talking about overall stove design and how certain features make cooking in the field a little easier. Click on the following links to read Part II: Determining the Right Fuel for Your Stove and Part III: The Future is Bright. This article was originally published in the January 2014 Issue of Toyota Cruisers and Trucks. If you found this review helpful, please consider using one of the affiliate links below. The price is the same for you, but a small percentage of the purchase price goes to me, which helps keep this site going. Thank you!